DETROIT – CruiseCompete has compiled a list of favorite cabins for families on premium cruise lines: Celebrity Cruises, Disney Cruise Line, Holland America Line and Princess Cruises. Premium accommodations and luxurious appointments are the signature of Princess Cruises’ expansive 460- to 687-square-foot suites. A Family Suite includes a spacious cabin, and large 95- to 241-square-foot balcony, along with special suite-only benefits. Suites feature a separate seating area with a sofabed, walk-in closet, full bathroom and deluxe amenities. Pricing for suite on the Emerald Princess 7-night Alaskan Cruise starts at $1,397.24 per person, double occupancy, not including port taxes and fees. Click here to learn more about Princess Cruises. To see Princess Cruises specials, click here. To get a quote for Princess Cruises, click here. Celebrity Cruises offers an impressive family option with their Reflection Suite, a 2-bedroom suite with 1,636 square feet, plus a 194 square foot veranda. It boasts a panoramic corner location, with a floor to ceiling sliding glass veranda door and window and an incredible sea view bathroom. Additional suite amenities include 24/7 personal butler service, complimentary mini bar stocked daily, complimentary internet access and complimentary laundry service. Reflection Suite guests also enjoy a dedicated private restaurant, exclusive access to the private Michael’s club, unlimited dining at all specialty restaurants and a complimentary premium beverage package. The Reflections Suites pricing currently starts at $2,165 per person, double occupancy, per night for a 7-night Caribbean Cruise, not including port taxes and fees. Click here to learn more about Celebrity Cruises. To see Celebrity Cruises specials, click here. To get a quote for Celebrity Cruises, click here. 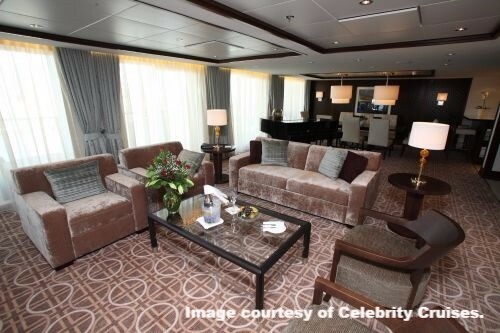 Holland America Line’s Pinnacle Suite is 1,290 sq. ft., including verandah. As another option, the Koningsdam family ocean-view staterooms are a first for Holland America Line. The 32 new specially designed family ocean-view staterooms will range from 222 to 231 square feet and feature special amenities such as two bathrooms and accommodations for five people. 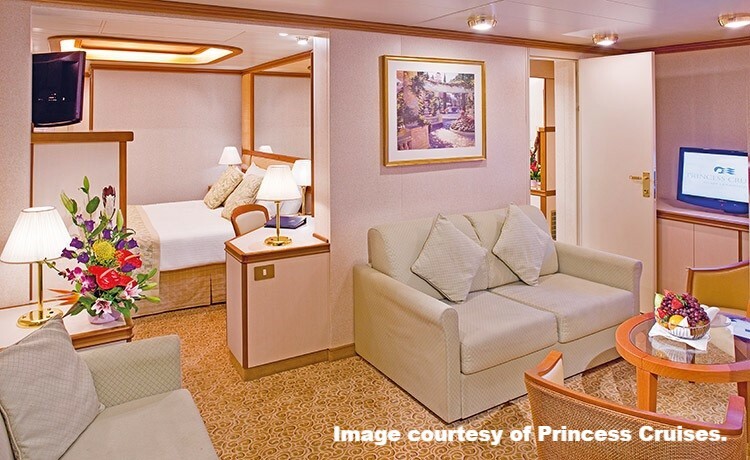 The line also offers triple and quad staterooms for families of three and four that wish to share a room. Connecting cabins are also available. The starting rate for the Pinnacle Suite on a Koningsdam, 7-Day Northern Europe cruise is $7,000 per person, double occupancy, not including port taxes and fees. The starting rate for the family oceanview stateroom on a Koningsdam 7-Day Europe cruise, departing May 22, 2016, is $1,799.00 per person, double occupancy, not including port taxes and fees… and the kids sail free! Click here to learn more about Holland America Line. To see Holland America Line specials, click here. To get quote for Holland America Line, click here. 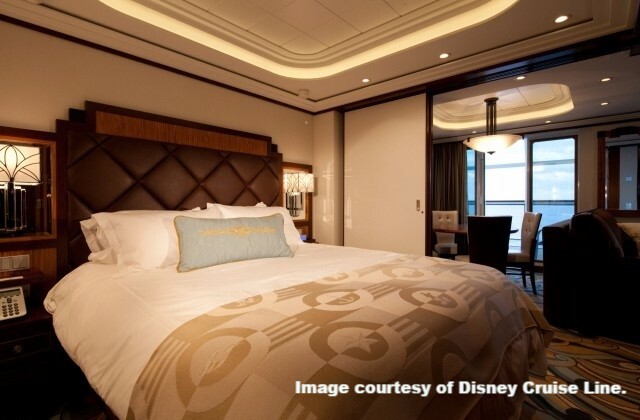 Some might argue that every cabin and suite aboard Disney’s ships are a “family suite,” and they wouldn’t be wrong, as this line is known for catering especially to families. However, they have a truly impressive offering in the Concierge Royal Suite with Verandah aboard the Disney Dream. This suite is 1,781 square feet, including the verandah, featuring a separate bedroom and 2 bathrooms, with double sinks, a rain-style shower and a whirlpool tub in the master bath. Additional amenities include concierge service, complimentary WiFi, a private verandah featuring a whirlpool tub, a pantry and wet bar stocked with water and sodas. The starting rate for the Concierge Royal Suite with Verandah on the Disney Dream 4-Night Bahamas cruise, departing May 23, 2016, is $3280.00 per person, double occupancy, not including port taxes and fees. Click here to learn more about Disney Cruise Line. To see Disney Cruise Line specials, click here. To get quote for Disney Cruise Line, click here. For more Family Travel resources, visit www.cruisecompete.com/resources.php. Click here to download your copy of the 2016 Family Friendly Cruise Travel Planner. CruiseCompete has been an online cruise marketplace since 2003, where travelers can come to research and book cruise vacations, compare offers, see consumer reviews of agents and agencies responding, then contact travel agents directly for more information and to book cruises. CruiseCompete is a member of the Family Travel Association, which offers the 2016 Family Friendly Cruise Travel Planner at Travel Resources. CruiseCompete is an Iowa limited liability company and is not a travel agency nor owned by a travel agency.